It’s the spookiest time of the year, but what’s a party without some amazing Halloween appetizers? We won’t complain about the abundance of candy during this holiday, but that’s no excuse to slack on the more savory treats! Check out our roundup of our favorite Halloween appetizers below, and have no fear when it comes to planning your Halloween events this season. 1. 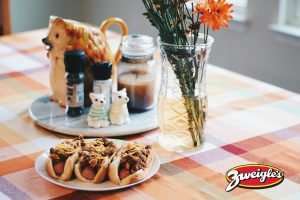 Mummy Dogs — Crescent rolls meet Zweigle’s hot dogs…if that isn’t a “killer” combination, we don’t know what is. 2. Halloweeño Jalapeño Popper Mummies — Believe it or not, hot dogs aren’t the only food that taste great as a mummified Halloween snack. Jalapeño poppers are a great addition to your appetizer array, and they’re always a hit with crowds. 3. Spider Web Taco Dip — Take this classic party dish to a new level by adding amazing spider web decor. You don’t have to sacrifice flavor to stay in line with your spooky Halloween theme. 4. Mummy Wrapped Brie — All you have to do is merely mention the word brie, and we’re in. This delicious recipe and accompanying creepy cheese board is sure to impress guests, and it serves as the perfect snack for all the adults at the party. 5. Mozzarella Eyeballs — An easy, cheesy Halloween finger food? Pure genius, if you ask us. 6. Jack O’ Lantern Chips and Dip — Jack O’ lanterns are a classic symbol of Halloween. That’s how we know guests will appreciate this goofy chip and dip arrangement! 7. Ghost S’Mores Dip — While we love bringing a savory twist to Halloween snacks, this holiday is of course the best time to indulge in a few sweets. Try this ghost s’mores dip for a real treat. 8. Spider Hot Dogs — Not only can you enjoy a Zweigle’s mummy dog this season, but now you can create spider hot dogs too! This tasty recipe puts the perfect spin on one of our favorite foods, just in time for Halloween. 9. Mummy Pizzas — We don’t believe you need an excuse to eat pizza. If you did though, let these mummy pizzas be it. 10. Halloween Monster Corn — A Halloween appetizer that’s both sweet and salty? It doesn’t get any better than that. 11. Ghost Pizza Bagels — Looking for an easy Halloween snack that the kids will love? Try these kid friendly ghost pizza bagels. 12. Cheese Pumpkins — With all the creepy Halloween treats, make sure to mix in a few fall favorites like these cheese pumpkins. Not only will they taste amazing, but you can munch on them all fall long! 13. Halloween Jack Skellington Ricotta Olive Tarts — If you’re ready to go the extra mile for your Halloween party this year, you can’t miss out on these Halloween Jack Skellington ricotta olive tarts. They’re the ideal savory Halloween appetizer, and the presentation is sure to turn heads. Are you celebrating Halloween this year? What’s your favorite Halloween party snack?